Hopefully, over time this page might appear liked I planned a structure for it. Now, at the start nothing could be further from the truth. Initially it will be odd and apparently disjointed topics that appear as the mood or other event take me at a moment when I have the time to write it up. How can you expect to make anything if you can’t hold it. 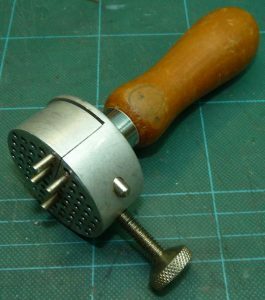 Fat fingers aren’t the best tools for holding minute little bits while you do jobs to them that often involves adding heat or considerable force. 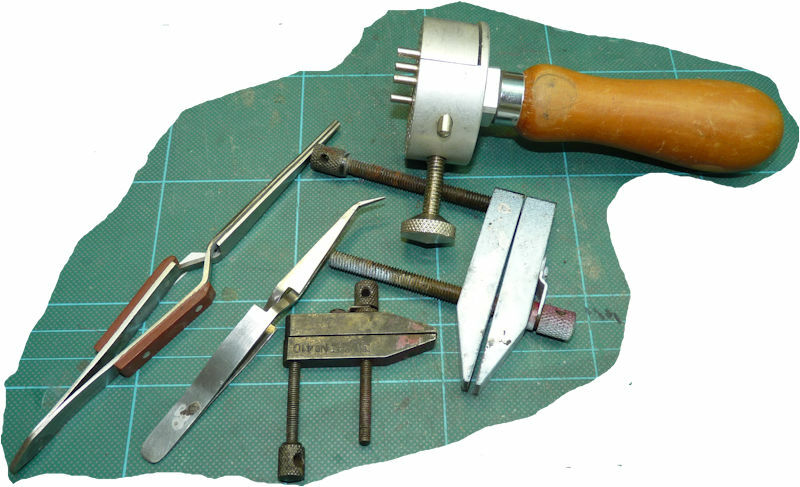 What follows is a small selection of gripping tools I use and some notes on their use. I have all sorts of tweezers and just two are illustrated here. the common thing with both of these is that they are sprung closed. This is handy for holding things without having to maintain physical pressure. Their disadvantage is that the clamping pressure isn’t very high so things held can move if what you are doing to them involves any force. You can get them like surgical clamps that lock on but I have never got on with them usually damaging or losing the item as I try to get them to lock or unlock. I probably have some somewhere but no idea where they are. I have always known these as Tool Makers Clamps ever since I had to make one from scratch as part of my apprenticeship (when they were proper things that took many years and resulted in a job). The one I made then is a bit bigger than these but its still in my workshop. Looking for these on-line just I see they are called parallel clamps with several sizes available. The small one is about seven quid. To my mind calling them parallel clamps is a misnomer because the way they work is all about not being parallel! 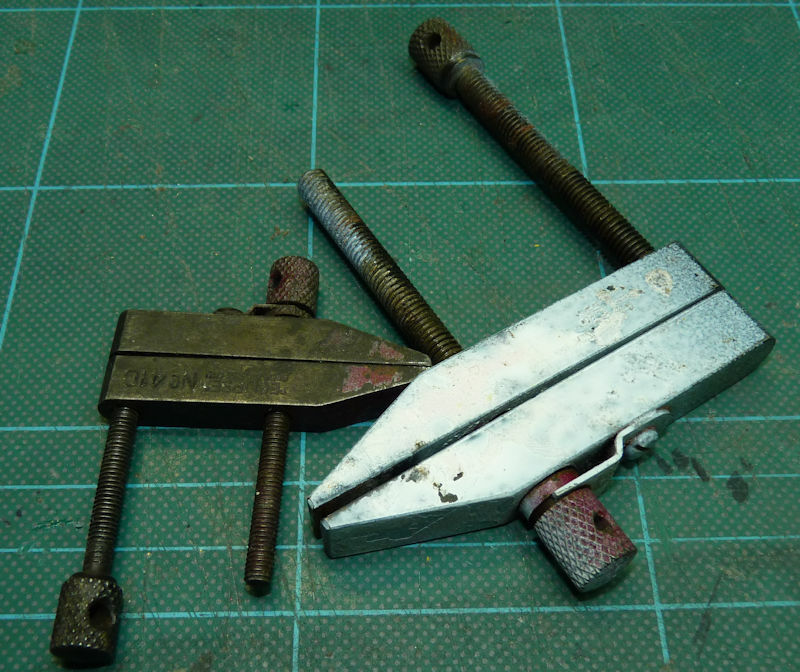 To take the example on the right, holding a Shay pick-up strip, the front screw is set so there is a small gap between the jaws whilst the back screw is backed off. The pick-up is then slid into the gap and the front screw tightened so its holding it a little so it can then be slid about until its where you want it. You then tighten the rear screw which whilst pushing the jaws apart at the rear piles on the clamping pressure at the front to the proverbial vice like grip. When building etched kits and so handling a lot of sheet material these two are probably my most used clamping tools. Wouldn’t be without them! 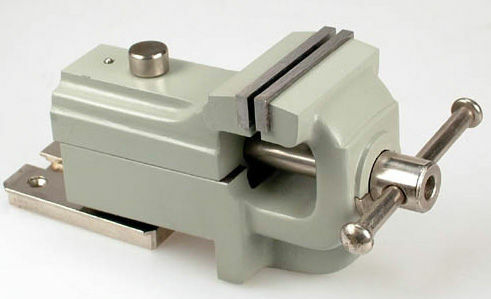 What sort of bench vice you end up with depends to a large extent on where you get to do your modelling. 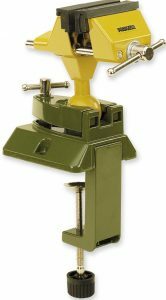 If you work on a temporary bench or claim territory in the kitchen you’ll probably want a clamp on type of vice like the two illustrated here. Don’t choose a suction fitted one. 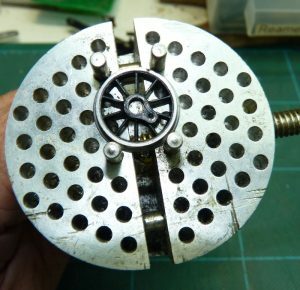 Make sure its the screw clamp as I have yet to find a suction one that stays where you put it. I started with one like the ten quid one and lived with it moving when sawing because the clamp was crap, with the jaws not closing parallel so not holding stuff. I may have saved a few quid on the vice but I could have saved a fortune in drill bits and piercing saw blades if I had bought a decent vice. I upgraded to the Proxxon one and its been a great tool. That said its role has changed now. Since I have done this for a living and have a room as my workshop I have graduated to two (at least) work stations. The Proxxon vice now lives in a cupboard most of its life but lives next to my DCC/Electrics/fiddly stuff work bench and comes out when something of that needs holding. The metal working and kit building work station (sounds grand 🙂 it’s a desk) now has one of these on it. This is a precision peice of kit and you do have to pay for that at around £85. 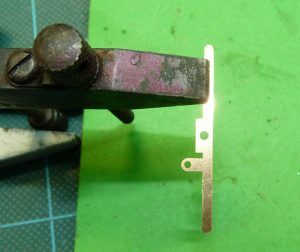 With this the shiny plate is physically screwed to your bench and the vice slides on to it and locks into place with a lever on the far side. 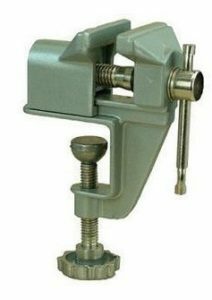 The jaws are hardened and parallel and stay parallel when you apply clamping pressure. The result is something that its strong rigid and holds your work piece solidly in place. If you break your piercing saw blade now its because your sawing action is rubbish! You can get extra base plates so you can have several places to work on your vice. I plan on adding my second to a wooden box like structure that clamps to the bench and raises the vice closer to my eye line but its in the “one day I’ll get round to it” queue. OK, I’ve looked it up. Apparently its called an engravers vice. Its speciality is holding odd shaped but whilst you work on them. Not a need it right at the start sort of tool but one to add later. To grip stuff you move the pins to suit the shape and then tighten the screw so the pins grip the object. Four pins work for a circle but some odd shapes work better with three.